New Zealand Art Print News: Sketches by Peter Arnold - original artworks or prints? Sketches by Peter Arnold - original artworks or prints? For many years New Zealand Fine Prints along with many other galleries and picture framers stocked prints of pencil sketches by NZ artist Peter Arnold. Arnold's drawings of popular places and buildings around NZ were originally published as prints in the 1980s. The different titles have gradually sold out over the past few years and are now completely out of print (sold out). However as a consequence of advertising Peter Arnold prints for sale at prints.co.nz until we sold out of the very last one just a few weeks ago we received a fairly steady stream of enquiries about whether a sketch by Peter Arnold was an original artwork or not - and also enquiries as to the value of what looks at first glance like an original pencil sketch by this artist. So if you are looking for information about this artist's work - perhaps having inherited a framed print/sketch - the perhaps unwelcome news is that you are almost certainly the owner of a reproduction print rather than an original artwork. Confusingly these prints were sold both as black and white images and hand coloured (by the publisher, not the artist). Either coloured or uncoloured they are reproduction prints, not original (i.e. handmade - for example an etching) prints or sketches. Their value is decorative rather than investment, nicely framed they are worth around $NZ50 each. 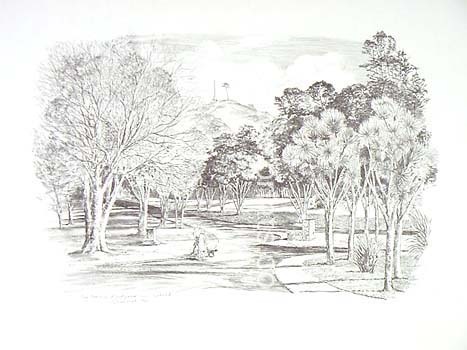 An example of the artists' style is the print of Auckland's One Tree Hill illustrated here - there were at least a couple of dozen scenes published in this technique and of similar appearance. If you are still convinced that you may have an original sketch rather than a reproduction we'd recommend getting an expert in paintings and drawings to take a look at the artwork in real life, try contacting an auctioneer of fine art near you or your local city council run art gallery. I have what appears to be a reproduction of a Peter Arnold original copy of Kerikeri Basin in colour, which is framed and signed," Peter Arnold, 1985" . My question is his signature, which appears to be in pencil, on all previous reprints? Yes, the original pencil drawings are all signed. This is reproduced on the print. You can check that it won't rub out! It will be coloured by hand though, they were nicely done prints. Just purchased a Peter Arnold today; Boats at Anchor signed & dated 1987 (looks like in pen.) It is square A1 size in a slim gold frame with glass. I thought it was a water-colour on w/c paper, fawns and green/browns and yellows. Colours still look great, but the paper is slightly discoloured at edge and has 2 or 3 brown spots. Have learnt a lot from all these emails. Thanks for your comment, we didn't realise that the Arnold prints were first published as early as that! Obviously there must be the original sketches out there somewhere and it is possible that you could be the owner of one of them. However there are some easy ways to tell the difference between original sketches and reproduction prints (see the article above and my reply to the previous comment). Another indication of whether you own an original or a print is how much you paid for the artwork in the first place and where you purchased it from. At the time an original sketch by a competent - but not high profile - NZ artist would have cost at least one hundred dollars and would have been bought from either a dealer gallery or directly from the artists' studio. I am Peter's nephew and I can tell you that he used a method of reproducing his work by lithograhing. Often he would countersign these in pencil as well. I have both some originals and such copies and suggest that the paper that most originals would have been drawn on would be discoloured by now whereas the prints would still be looking reasonably fresh. The families lost contact with each other and I need to contact him. If anyone knows if he is still alive (he would be approx. 82 now), please advise-agmcgregor@icloud.com. hi there andrew, I have a framed pencil drawing of "The Bridge Hotel in Warkworth" and sign and dated by Peter Arnold 78"
Hi Maureen this is special the print is sold out, years ago and it should be personally hand signed, the original was sold to the hotel 16 years ago. Hi Andrew correct dad has them all no one has them he only sold maybe two or three, when I was in the gallery with him, he is ill and won't live much longer. If it's a print conservatively framed and in good condition (without foxing or light damage) it has a value of about $50. If it is one of his much rarer original sketches it would be worth around 3-4x this amount at auction. The best place to sell it if you have an original sketch by Peter Arnold rather than one of the very similar prints (see the article and answers to other comments above on how you can tell the difference between a print and a sketch) would be a Wellington based fine art auctioneer such as Dunbar Sloane. Could well be Peter Arnold if you purchased them in New Zealand. He chose architectural subjects that were well-known - can you identify the buildings? Hi, I have just been photographing my prints ready to sell and also have one of the Egmont ones, co-signed by Amanda and resigned in pencil by Peter. Hi, in the late 1970s Peter Arnold had a studio in Durham Lane, Auckland city, and taught many adult students. It is quite likely that Amanda Appleby was one of his students and you have a co-signed original. To my knowledge, there are no co-signed lithographs from 1979. The first lithographs of his sketches were produced about 1978 and were numbered limited editions, personally signed by Peter Arnold. Many of these he also coloured himself. If your sketch has two signatures, one is reproduced on the lithograph and the other is the original artist. Peter always signed Peter Arnold, never just Arnold. In the 1980s he had a studio in Russell, Bay of Islands. By this time the lithographs were produced in larger quantities, not numbered and generally not personally signed. He sold hundreds of them, small and large, framed and not framed. I don't know if any of the original sketches were sold and I'm not sure how many limited editions were produced. In reply to Andrew, his nephew, I think he would be about 78 years old now, last known to be in Europe. Peter lives in Nelson.not Europe. I was a friend of Peter Arnold in the late 60s we use to catch the bus to work together. He also introduced me to what was to become the father of my first child. We lost touch as I went overseas but I did catch up with him again when he was selling his prints in one of the shopping malls. I have an original print dated 1978 of Russell waterfront that Peter gave me himself. It was never framed so the paper has yellowed with age and it has some small brown spots. Do you know how much it would be worth today. I worked with Peter and was also married to his son. I can tell you that his originals were all huge, sketched on very large pieces of paper A1 size. He often signed his prints so there would be 2 signatures on them, 1 printed and one original. I went with him on a number of occasions to the printers and as mentioned above, they were reproduced through lithography. He also handcoloured with pastels a lot of the prints, additionally I handcoloured them as well. Amanda Appleby was one of his students and also did some work with him before my time with him. I knew he moved to Europe, it was always his dream to go and live there. He is English by birth and trained in England as well. He was also an amazing water colourist - I have a large A1 orginal on my bedroom wall that he painted for me for my 21st birthday. Brenda its me Vanessa Arnold, your alive? Peter is 84 n I'll, lives in Nelson with his son. He has most of the originals still in perfect order. I am here in the UK and I too have two very fine prints, hand coloured. 1] Port Nicholson Harbour, Wellington '84. 2] Russel Bay '86. They are fine examples ready mounted for framing. I have a Peter Arnold print of Boats at Kerikeri Island in color signed and framed. Does anyone know the value of this item? mt egmont with amanda appleby--1979.
boats at kerikeri basin----all the above signed in pencil by peter arnold 28th january, 1983.
picked them up at charity shop this am.i like them. Both have 2 signatures on each ....each have a light pencil color and a dark pencil color when signed. I purchased The Wairarapa 1982 today from an Auckland hospice shop. It has 2 signatures, the second in light pencil centre left and reads, To Sarah best wishes Peter Arnold 28th Jan 83. For anyone interested, South Sea Art in Russell, Bay of Islands has most of his prints and the rights to print more. I also have a nicely framed, coloured, large picture which says 'Paihia Beach, Bay of Islands NZ, 1980, with a second signature 1985. I have just picked up a Peter Arnold sketch of Port Nicholson Harbour, signed twice and dated 1984. I found it at our 2nd hand shop in Wynyard, Tasmania and I was very excited because I am from Wellington!! I'm really happy with my find!! I have the same picture and discolor and is in pencil if I have some how got the original or one of the sold out few how much is it worth? Just purchased a Peter Arnold hand coloured lithograph of The Old Stone Store KeriKeri dated '81 with the double signatures at The Mill Markets in Warrnambool, Australia. Thanks for the info, I love it and am a new convert! I have brought a print of Mt Egmont, from Pukerkura Park, New Plymouth, New Zealand. Signed Peter Arnold 1982.
its awesome. I think its a beautiful pencil sketch. Hi you lucky lady to have his oil, even as a daughter I never got one, he is very collectable and his oils are priceless! I have a print ( I think, not original ) of "Boats at Kerikeri Basin" which is black and white. It only has 1 signature on it, 1984 ( in pencil) and from memory, I think Peter signed it when I bought it. What would be the value of this if I was to sell please? Very interesting reading I have a print of Kimberley Reserve in Levin signed and dated 1983 that I have had framed. I was planning on selling on trade me as no room to display. From memory I brought it in the Johnsonville mall in Wellington about 20 years ago from a man and a lady, she mentioned that the man (I imagine now to be Peter ) had drawn it and she had coloured it. I have a print of Paihia Beach, Bay of islands signed and dated 1980. Just want to know what its worth? I to have a print1980 of the Police station at Russell bought at op shop too? I too have a signed drawing by Peter Arnold of Pompallier House. I take it from the comments above that it's a lithograph and then painted. I has the double signature and is dated 1981. Like all the other owners I would like to know its worth. I have what I believe is an original pencil drawing by Peter Arnold titled "Boats at KeriKeri Basin" dated 1980. I purchased it at his shop near the Bay of Islands about 1995. If I remember the conversation correctly he was thinking of retiring from selling prints at that time and therefor willing to sell some of his originals. Hello, I have three prints that I will soon be placing on ebay (or similar) so let me know if you would like them. They have all been co-signed by Peter in pencil. I would love them to go to someone who appreciates his work. Hi there I have just purchased a Peter Arnold print "Russel Waterfront Northland N.Z" signed Peter Arnold 78. There is another signature on the RHS Peter Arnold. This fully framed in glass. Very excited about this. It has the Gables Restaurant in the print. Just need to understand the second signature on the RHS. I purchased in New Zealand in the early 1990s a Peter Arnold framed print entitled "Boats at the Keri Keri Basin" that has a second signature by Peter Arnold in the right hand corner as well. I understand that Peter Arnold did sign a number of his prints this way prior to having them framed. I've been informed that this doesn't increase the value of the print worth around $50 in U.S. currency. would also like to know the value. hi i have just found Boats at Anchor 1987 and signed by him, what would it be worth thanks? I have recently found in my late father's belongings an A3 black and white pencil drawing with the writing on the bottom right-hand side of "Kemp House, KeriKeri Peter Arnold 1980". His pencil signature is also on the bottom left-hand side. The drawing is not framed and is just on watercolour paper. I have no idea if it is a print or an original and would be interested to know what people think. My father obviously bought it when he was on holiday in New Zealand for 6 weeks some years ago. Hi I was wondering if a sketch I have was one of Peters works, is there a way I can email you a photo to confirm? Send it to mkutner@emory.edu and I'll take a look. Hello my name is Paul and I reside in Beaconsfield Victoria Australia . It is a print as I can see the dots under magnification, I would like to sell it but I have no idea of the value . Puhoi Hotel, Near Auckland, Peter Arnold, 1978. It is A1 size framed and the paper has yellowed with age. Just wondering if it is original and what the value of it could be? I have the same black and white drawing same size, with two signatures, one on bottom right, dark pen includes his signature, Puhoi Hotel near Auckland dated '78 and a pencil signature on the left. This size seems more likely to be an original sketch as opposed to a print of one the artist's drawings. Valuing an artwork that is not a print is not in our area of expertise sorry. Hello, I have recently purchased a pencilled sketch of St Faith's Church, Rotorua, New Zealand. with a pencilled signature of Peter Arnold. Looks like a copy of a sketch, however his signature looks like it was signed by a different pencil, much lighter in colour. He has also written his name and year 1985 on the right hand side. which is the same print aS As I have lived in Rotorua all my life fell in love with it on sight. Price paid $35.00. Price sounds about right, signed in two places because the second signature is in pencil whereas the first one is printed from the original sketch. Hi there, I have a Peter Arnold coloured drawing of the Puhoi Hotel. I was present when he signed it in pencil for me. Any value now? Hi there, I have 2 Peter Arnold prints done in pencil both dated 1982. One is Chateau Tongariro and the other is of Mt Egmont. Is there any value in these. My parents bought them around 1982. Hi there, Our family has an oil paining done by Peter Arnold. My grandparents were close friends with Peter's parents and Peter and his sister used to stay with my grandparents quite a bit. Peter gave the oil painting to my grandparents and now it is with my parents. We would like to try and find out if there is anybody who would be interested in this painign at all. It is of a violin standing against a violin case with some music and a rose in the foreground. Can you post a photo & asking price? Can you post a picture & some idea of what you are selling it for? we are not sure what we would want for this - a good home more than anything. Maybe make an offer. I did try to upload a photo but couldn't here. Hi there, my husband found a framed black and white pencil sketch (background has yellowed with age) probably 30 years ago, it is called "Old House in Featherstone 1981"with signatures on both side, it has the original frame which was done in Waynes Gallery in New Plymouth, would like any information on it, such a lovely drawing.